People often associate crafts with traditional materials, like wood, cloth, paint or clay. But when non-traditional materials are used, it can give a craft a new meaning. To give an added edge to your crafting experience, try using barbed wire. Add an edge to Christmas with a barbed-wire Christmas wreath. Though it might not appeal to everyone, this craft idea just might help everyone see the real "point" in Christmas. Simply mold the wire into a wreath design by twisting it as you wind it into a circular form. 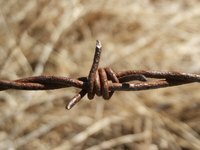 Use wire and pliers to twist the barbed wire and secure it in your desired shape. The silver will reflect the light of the many Christmas lights. Hang it out of the reach of children. Roses are romantic, yet they also carry a sense of danger. So will your barbed-wire rose. Barbed wire serves as a perfect stem to a rose project, as the two carry nearly identical forms. The barbs of the wire reflect the sharp thorns of the rose while providing sturdy support. Red suede leather--or any other color of your liking--can be used to form the petals. For a more rustic look, use oxidized tin. Tin-snips will help you cut it into the shape of petals that can be easily formed with your hands. Attach it with glue, wire or by welding. Sometimes, an average picture frame can seem, well, boring. After all, frames are basically four pieces of nearly flat wood surrounding your favorite photos or art. Like it or not, the frame is a part of the finished product, sometimes making a photo of a special event in your life seem ordinary. Spice it up with a little customization. Use pliers to mold the barbed wire into the shape of your old frame. Use a hot glue gun to fasten the wire to the frame. You can also use the wire for letters to spell words, phrases and names that describe the photo. If you are worried about wandering fingers getting poked, use a file to dull sharp barbs.